American Express and the National Trust for Historic Preservation are pleased to announce that 13 historic places in Washington, D.C., Maryland and Virginia will receive grants as part of Partners in Preservation’s $1 million commitment to preservation efforts in the area. In addition, American Express and the National Trust for Historic Preservation are giving a $5,000 award to each of the remaining 11 Partners in Preservation historic places in recognition of their participation in the initiative and their commitment to preservation efforts. Thank you to everyone who got involved to support Partners in Preservation and the many historic places across the Washington, D.C. Metro area. The finest example of fourteenth-century English Gothic architecture in the US, the Cathedral has borne witness to State Funerals, national prayer services at times of celebration and mourning, and the last Sunday sermon of Dr. Martin Luther King, Jr. As a leader in convening people of every race, class, and creed, this beacon at DC’s highest point serves as a spiritual home for the nation. 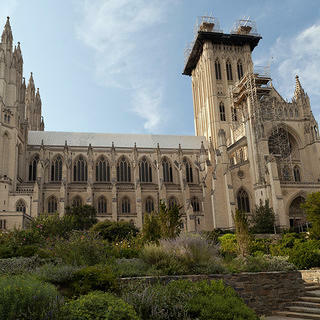 The Washington National Cathedral will receive a grant for $100,000 that will go toward restoring two bays of the vaulted ceiling inside the nave. Once complete, the Cathedral will be able to remove the netting that has shrouded the building’s magnificent interior since the earthquake in August 2011. All Souls Church Unitarian, Adams Morgan, D.C. This Georgian Colonial church was one of the first integrated movie theaters in DC, a clubhouse for neighborhood youth, and a tutoring center for immigrants. Home to a congregation that has fought for abolition, civil rights, and affordable housing, All Souls also hosted Mrs. Roosevelt’s integrated ladies’ teas, was one starting point for Dr. King’s March on Washington, and witnessed signing of DC’s marriage equality law. A $50,000 grant will repair the historic bell tower, including clock, stonework and windows. Carter G. Woodson Home National Historic Site, Shaw, D.C.
Dr. Carter G. Woodson was a scholar, author, publisher and is known as the “Father of Black History.” The Woodson Home is a three-story Victorian rowhouse that was the original headquarters of the Association for the Study of African American Life and History (ASALH). Currently closed to the public, this property will be a museum honoring Dr. Woodson’s life work and that of the ASALH. A $75,000 grant will rebuild the front and rear façade in order to stabilize home for public access. Colvin Run Mill, Great Falls, Va.
Now a partially restored, operational gristmill, the site includes the mill head and tail races and a late 19th century general store that originally stood across Colvin Run Road from the mill. As the sole surviving operational 19th-century water-powered mill in the DC area, we engage hundreds of thousands of visitors per year around this technological innovation and the social legacy of its working class. A $75,000 grant will bring the 18th century grain elevator into working order. Congressional Cemetery, Barney Circle, D.C. Established as the first national cemetery to bury Congressmen in Latrobe-designed centotaphs, Congressional Cemetery has become the final resting place for over 65,000 people including such notables as Mathew Brady, J. Edgar Hoover, and John Philip Sousa. Its interior roads and paths conform to L’Enfant’s original grid system for the city, said to be the only extant topographical record of the city’s original grade and slope. A $50,000 grant will replace and reconstruct a row of 26 mausoleum vault roofs. Dumbarton Oaks Park, Georgetown, D.C.
A 27-acre pastoral oasis within the bustle of Washington, the Park unfolds through shaded woodlands, wildflowers and meadows, over rustic bridges and waterfalls. Once the “wild” garden of the Dumbarton Oaks estate, one of America’s finest cultural landscapes, the Park was given to the public in 1940 and is treasured by joggers, school groups, artists, and birders. The Park’s sustainable restoration will inspire advocates of historic landscapes nationwide. A $50,000 grant will repair garden’s original built structures including viewing platform, stone houses, and retaining wall. The GALA Hispanic Theatre at The Tivoli, Columbia Heights, D.C. The Tivoli was built in 1924 as the largest movie palace in the region, boasting an ornate gold-gilt dome dubbed “the Temple of the Arts”. During the 1968 riots, the neighborhood was burned and continued to deteriorate, but Tivoli was left intact and was boarded up in 1976. After raising millions, GALA has reopened Tivoli, allowing it to serve as a landmark for Washingtonian cultural history. A $35,000 grant will restore three ornate interior domes. Settled in 1937 as a cooperative New Deal era community, Greenbelt is now nationally recognized for its unique design and strong sense of place. This old fashioned, single screen theater has been at the heart of Greenbelt’s commercial core for 75 years and is in danger of becoming a thing of the past. Restoration of the historic lobby will ensure the continued viability of this hidden treasure. A $75,000 grant will renovate art deco lobby. LAMB at Military Road School, Brightwood, D.C. The Military Road School was constructed on the site of one of the city’s first public schools built for freedmen, serving for many years as the only school available to African American students in the upper Northwest neighborhood of DC. This year marks the building’s 101st anniversary. Breathing life back into this historical building provides an opportunity that preserves the past while building the future. A $60,000 grant will repair exterior of school building including columns and cupola. Meridian Hill Park, Columbia Heights, D.C.
Meridian Hill Park is a nationally significant example of Neoclassicist American park design first proposed in the 1901 McMillan Plan. The exposed aggregate concrete throughout creates a public park whose ambitious scale, intent, and historic integrity has not been matched in the United States. Today, it serves as a gathering place for the local community as well as for visitors from around the world. A $50,000 grant will stabilize and repair exposed aggregate concrete grotto. Metropolitan African Methodist Episcopal Church, Scott Circle, D.C. This National Cathedral of the A.M.E. denomination has been symbolic of the sustained strength of a people and their belief in the equality of all people – the first independent Black religious body in the US – from 1816 to 1896. This pulpit has been symbolic of the sustained strength of a people and their belief in the equality of all people. The land-site is the oldest continuously Black-owned parcel of land in the District of Columbia. A $90,000 grant will restore stained glass windows on church’s primary facade. Mount Vernon, Mount Vernon, Va. The “Father of Our Country” George Washington’s example of character and leadership is timeless, and his estate reflects the personality and talents most consistently revered in American history. The large dining room, in need of major restoration, welcomes over one million annual visitors and is a shining example of historic preservation that can inspire history lovers of all ages. A $100,000 grant will paint, plaster and restore Washington’s Large Dining Room. Sixth & I Historic Synagogue, Mount Vernon Square, D.C. In 1900, Chinatown was home to multiple synagogues and a vibrant community of Jewish immigrants. The synagogue at 6th and I Streets was occupied by a Jewish congregation and then an AME Church before being saved from becoming a nightclub by three Jewish real estate developers. Reopened in 2004, Sixth & I redefines the 21st-century synagogue through the intersection of cutting-edge arts, culture and Jewish life. A $75,000 grant will repair and preserve a dozen of the Synagogue’s stained glass windows. Abner Cloud House at the C&O Canal, Georgetown, D.C.
Clara Barton’s Missing Soldiers Office, Penn Quarter, D.C.
George Mason Memorial, National Mall, D.C. The Kennel at Aspin Hill Memorial Park, Silver Spring, Md. Living Classrooms of the National Capital Region, Anacostia, D.C.
National Museum of Women in the Arts, Franklin Park, D.C.
U.S. Marine Corps War Memorial, Arlington, Va.